TYCO's 1991 Catalog is an 8-1/2" x 11" full-color publication containing 161-pages. The table of contents for 1991 lists TYCO's various product lines, which include: Radio Control; Boys Action; Electronic Racing; Electric Trains; Games; Activity Toys; Dolls; Blocks; View-Master; and Electronics. The Electric Trains section continues to find itself shrinking and becoming only a minor player in the TYCO product lines. Trains begin on page 64 and run through page 71. 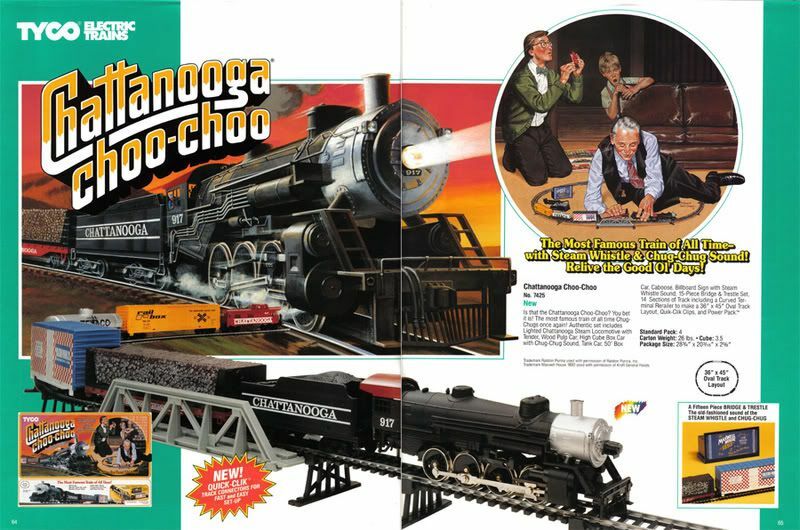 There are six train sets found in the 1991 TYCO Catalog. The first set featured is #7425- Chattanoog Choo-Choo. Though offered in the past, it is listed as a "NEW" item due to changes in the set's consist. The Yugoslovian-made substitutes for original Hong Kong-made trains are found in most train sets for 1991. The Overnight Freight(#7412); Santa Fe 72(#7415); and The Railroad Empire II(#7436) are all examples of this change. 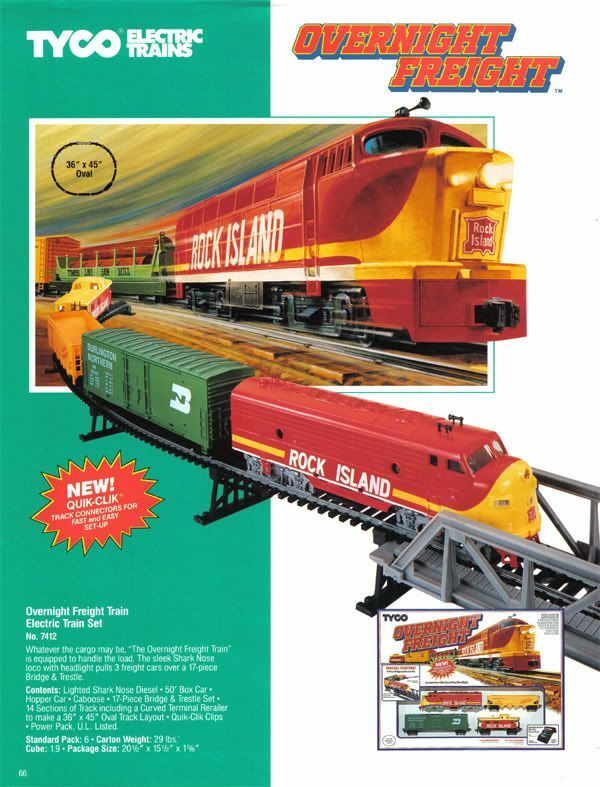 The Overnight Freight's train set box shows the Rock Island Shark Nose diesel. The set's contents and display image features the F-9A Yugoslovian-made loco. The Santa Fe 72 set shows a GP-20 on its box, but a Yugoslovian Alco Century is what actually came in this set that year. 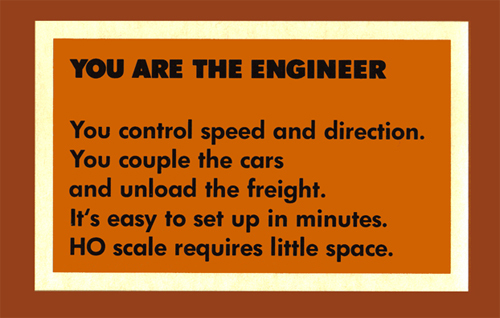 The Railroad Empire II follows the same rule. It shows a GP-20 on its box, then has a Hong Kong-made Alco Super630 for the display picture, but shows a Yugoslovian-made Century 628 in the train box. The description in the catalog does call for a "Lighted Alco 630 Diesel." 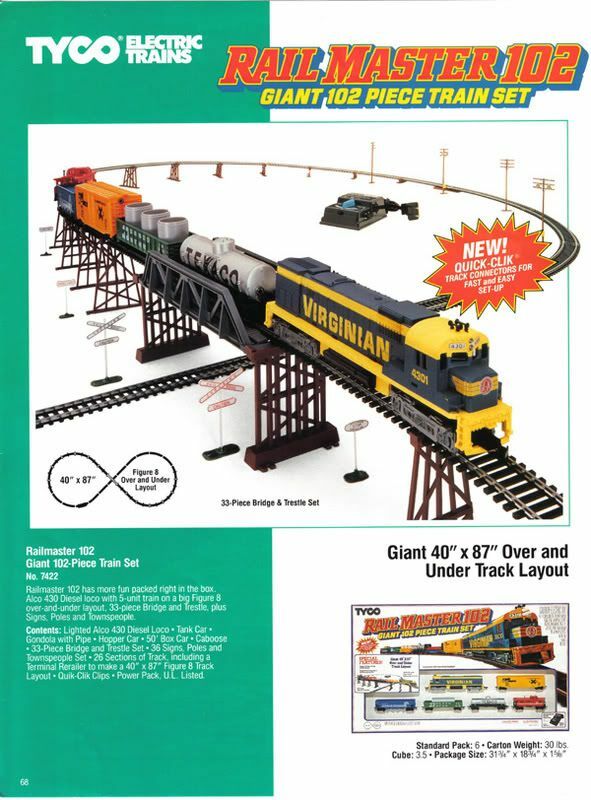 The Rail Master 102(#7422) train set shows Hong Kong-made freight cars and the original Alco Century 430 dressed in Virginian. I have seen examples of this set though with the Yugoslovian replacement items. 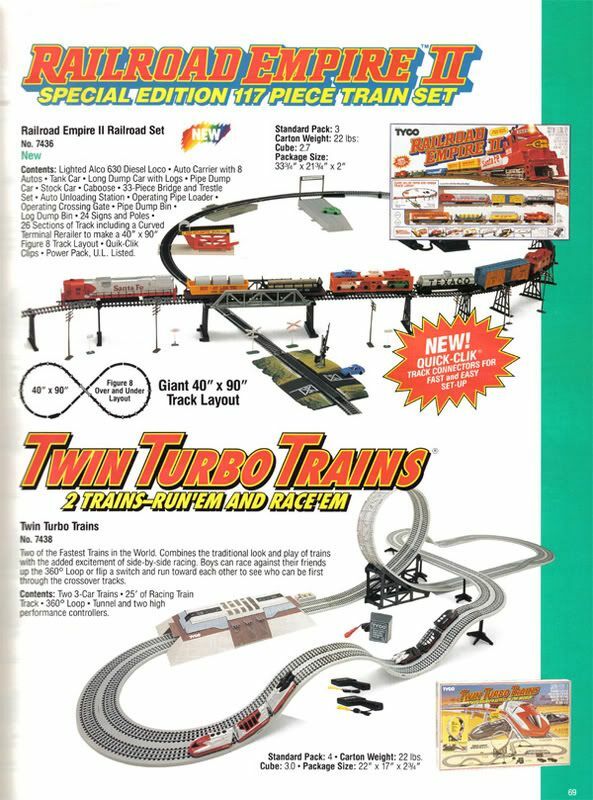 The last train set featured in the 1991 catalog is Twin Turbo Trains -#7438. While other TYCO Turbo Trains ran on standard railroad track, this version rides on a track that appears to be a closer relative to slot cars than trains. The Turbo Trains for this set are a three-car set and are decorated for Santa Fe and Pennsylvania. I have also seen Chessie System versions for this three-car set. 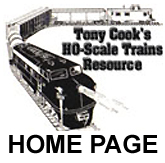 Pages 70 and 71 feature TYCO's accessories, kits, locos, and freight cars for 1991. 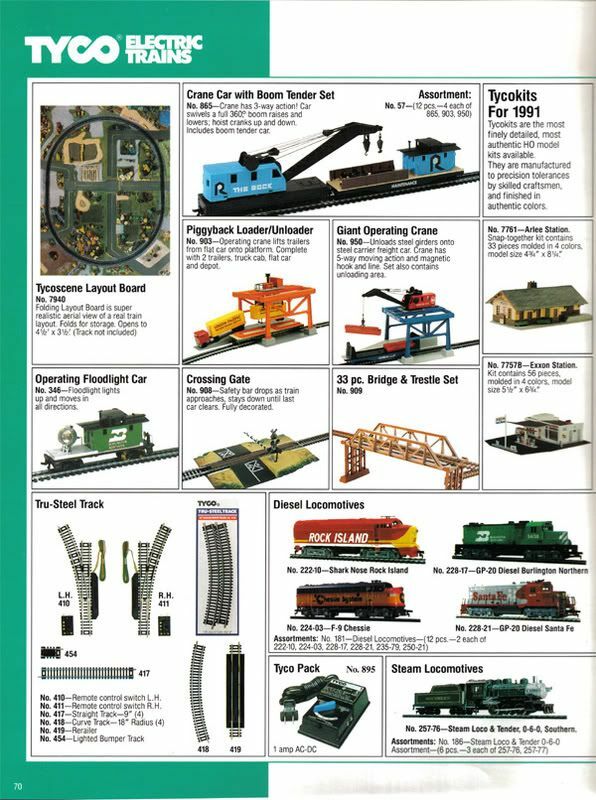 Among the offerings for '91 are: The TYCOSCENE Layout Board(#7940); Operating Floodlight Car-BN(#346); Crane Car with Boom Tender-The Rock(#865); Piggyback Loader/Unloader(#903); Giant Operating Crane(#950); Crossing Gate(#908); 33-pc. Bridge & Trestle Set(#909); Tyco Pack 1-amp AC/DC(#895); and an assortment of Tru-Steel Track. The TYCOKITS for '91 are Arlee Station(#7761); Exxon Station(#7757B); Old-Time Station(#7763); Truck Terminal(#7758); Three Houses Under Construction(#7759); Trackside Sand House(#7763); Machine Shop(#7764); Crossover Signal Bridge(#7767); Signal Tower(#7768); Water Tower(#7769); Barber Shop(#7771B); Drug Store(#7772B); Used Car Lot(#7796B); Fruit Store(#7797B); and General Store(#7798B). 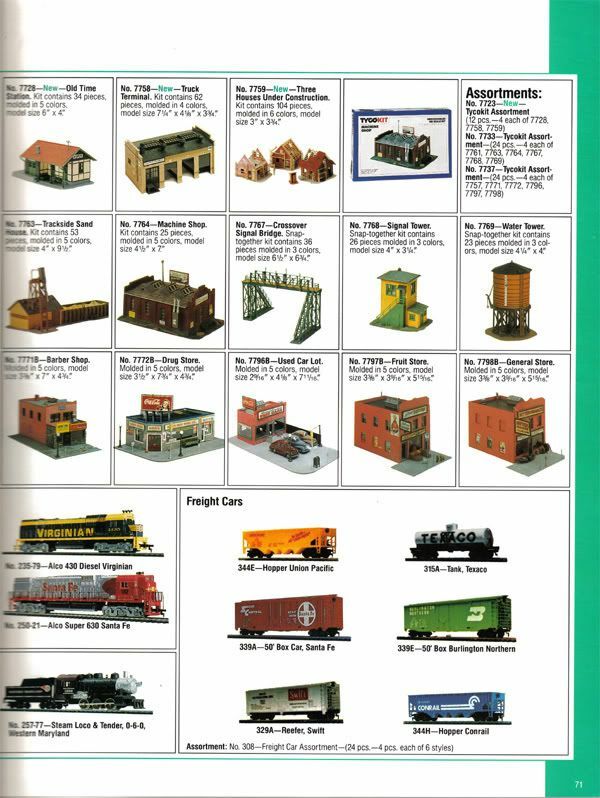 Listed as "NEW" for 1991 are three TYCOKITS: Old Time Station; Truck Terminal; and Three Houses Under Construction. 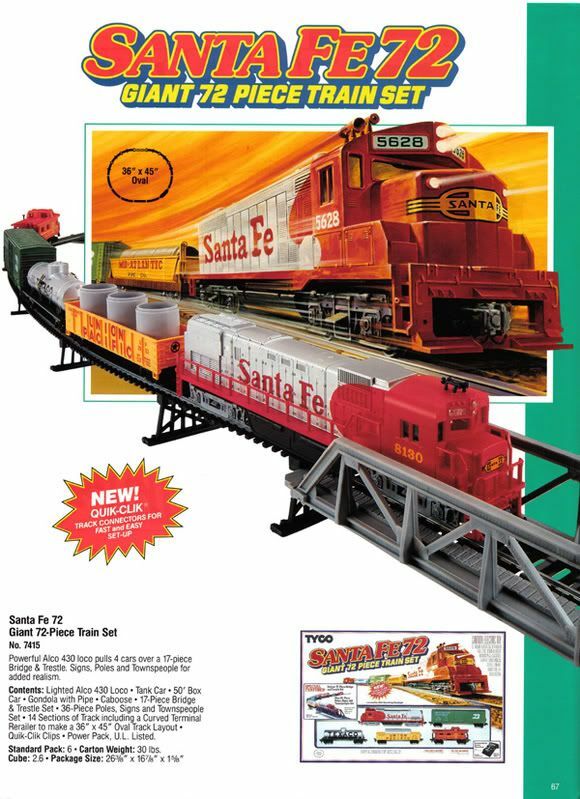 Only the Old Time Station(#7728) is actually a new addition to TYCO's kit line. The Center Street Series kits are no longer designated as such and are simply listed among the TYCOKITS for 1991. All five of the former Center Street Series kits carry the "B" designation, which previous catalogs noted that meant they included a free Light Kit. No mention is made in the '91 catalog, but one assumes this is still the case. The Exxon Station also carries a "B" in its number. Diesel Locomotives for 1991 are: Shark Nose Rock Island(#222-10); GP-20 Burlington Northern(#228-17); Alco 430 Virginian(#235-79); F-9 Chessie(#224-03); GP-20 Santa Fe(#228-21); and Alco Super 630 Santa Fe(#250-21). I have yet to see any of the Yugoslovian-made replacement locos appear in TYCO boxes as separately sold items. It is my understanding that they were only found in train sets. Steam Locomotives in 1991 are two 0-6-0s: Southern(#257-76) and Western Maryland(#257-77). The roster of Freight Cars for '91 includes only six examples: Hopper Union Pacific(#344E); Tank Texaco(#315A); 50' Box Car Santa Fe(#339A); 50' Box Car Burlington Northern(#339E); Reefer Swift(#329A); and Hopper Conrail(#344H).